Lately, Ruby has been fascinated by plastic buckles, the kind you’d find on a backpack. She has spent a solid half hour intently futzing with the buckles on her booster seat. The problem is that she can eventually clip them, but can’t open them again, so she comes to me for help. After several repetitions of this, I began to design a solution: a toy with LOTS of buckles. I started at the most excellent Seattle Fabrics, which is a great source for outdoor fabrics, including webbing and all kinds of fasteners. As I browsed, a plan took shape. 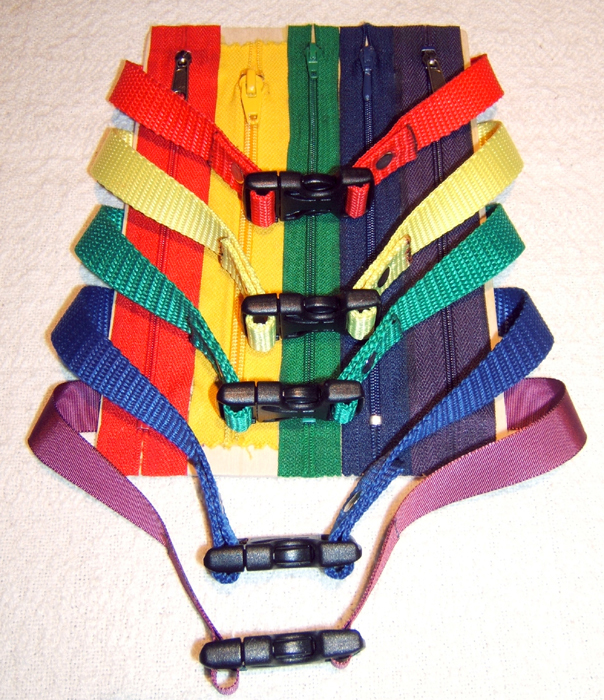 I selected some buckles, webbing, and zippers. A helpful guy at Ace Hardware gave me a few suggestions, and I bought a couple of other supplies there. Then, I spent two naptimes constructing the project (I have yet to think of a good name for it). The toy was designed to be flat, light, and therefore easily portable. It features five buckles, which can be buckled in any combination. 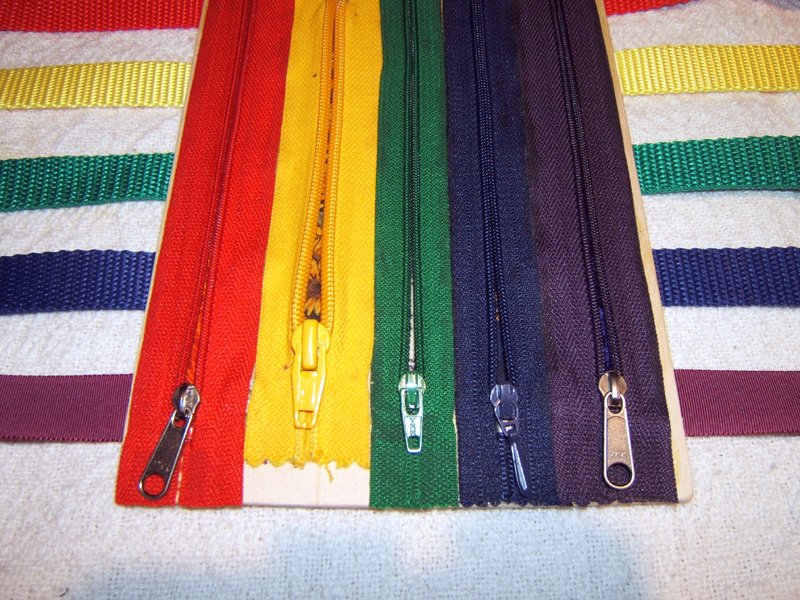 There are also five zippers, because Ruby likes zippers too. (It is built on a thin piece of wood, so it’s firm enough to easily zip.) Inside each zipper is a hidden pattern or texture for her to discover. Ruby will try it for the first time tomorrow! UPDATE (Aug 2008): �Since I posted this entry, some small family-owned companies have begun manufacturing buckle toys. Check out http://www.buckletoy.com, http://www.bucklepuzzle.com, and http://www.buckleyboo.com to see and buy their products. Toy design, and all pictures, are copyright Kate Leroux, 2007. That is awesome … also, your pictures of Ruby are most definitely too cute! Wow! I want one! I promise I would share with my daughter. Imagine the possibilities with two of these toys…. 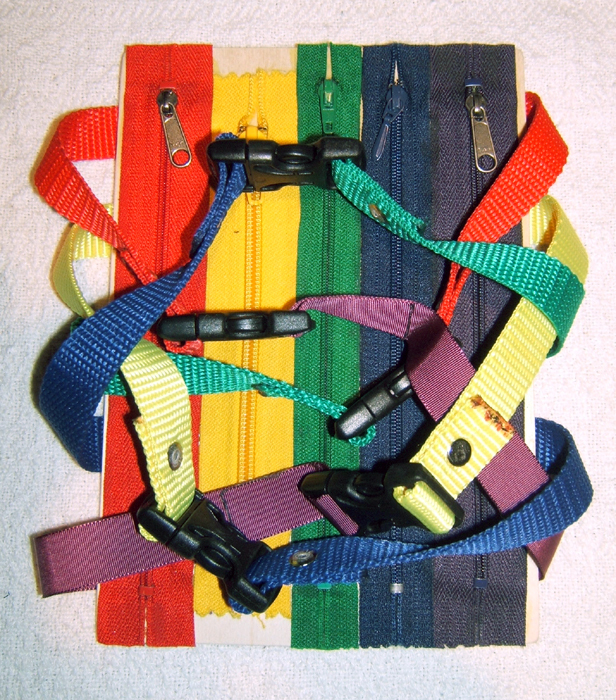 My niece loves buckles, and I am looking to get a toy or make one similar. What an amazing design! You aren’t selling them, are you? I have an 18 month old son and also noticed he loved buckles. For the past 6 months I have been manufacturing a toy called “The Buckle Toy” It will be ready to sell at the begining of June. http://www.buckletoy.com I hope you all love it as much as I do. Buckletoy.com is now up and running. Check out this cool toy.